Handmade by Kathie K: When is summer coming? If you're like me, summer just can't come fast enough. So I thought I would make some summer of my own. Since I've been away from card making for awhile, I feel like I have lost my creativity. So I checked out Pinterest and dusted off some old idea books and started experimenting. I am absolutely obsessed with my new Big Shot. I love die cutting! Here's a new card I made for an upcoming birthday and I love, love the edging. 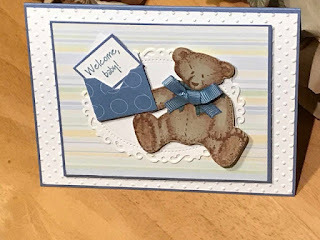 I used a Spellbinders set called Bracket Borders One. It doesn't show up very well, but the center of the yellow flower has glitter in the center. I think it adds a nice touch. I also found inspiration in the latest Stampin' Up Salebration catalog and made this sweet, springy birthday card for my niece. I just love using metal embellishments. Well I hope this brings a little Summer to your life. Happy crafting!